As we head into the new year, it may be the right time for you to review the cost of printing and shipping your global training materials. If you’re offering courses in cities both across North America and around the world, or if you're offering online courses multiple times per month, than it may be time to review costs associated with printing and shipping training materials. Do you currently offer classes internationally in Asia, Europe, the Middle East, Australia, and South America? Or do you have plans to add international locations this year? Do you currently print and ship most of your courseware from only 1or 2 locations? If you answered yes to these questions, than a print and fulfillment partner that offers a global print network with a presence near the countries in which you do business is going to save you money. Here’s why: shipping costs will be sky-high if your printer prints course materials in North America and ships them overseas, especially in the regions that are most popular for high-tech training, such as China, Saudi Arabia, India and Europe. Aside from preventing logistical nightmares, if your print materials are shipped outside of North America, you’ll save thousands and thousands of dollars by working with a partner who has a global network of print and fulfillment facilities worldwide. By printing as locally as possible, we've found that our Education Services customers save an average of $80,000 annually in freight alone. With a global print network, you'll get both peace of mind and extreme savings. A second option to realize significant savings is to switch to eBooks. Secure document delivery (ebook) is the best way to ensure your training materials for both public classroom and online instructor-led courses get to your students both extremely quickly and cost effectively. 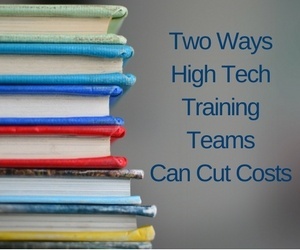 Switching to eBooks can typically save you as much as 50% compared to printing and freight, and can be used for instructor-led face to face instruction, virtual classroom courses, and on demand training. It also pays off to think ahead. If you'll be moving into some international markets this year, or moving more courses to a virtual classroom delivery platform, creating the infrastructure to support your courseware operations during this growth phase will save you both time and money in the long run. Many Education Services management teams find a combination of printing some materials using a global print network, and strategic use of eBooks provides both a great experience for their students and a significant operational savings for them. Other customers have found that moving strictly to eBooks is the way to go. An experienced fulfillment partner can help you make this call. We understand that your particular business is unique, so we invite you to get in touch to find out how much we can reduce your costs for all of your training materials.